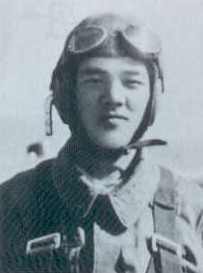 On April 8, 1945, Second Lieutenant Heiichi Matsuzawa took off from Kikaijima Airfield and died in a special (suicide) attack west of Okinawa at the age of 22. He was a member of the 42nd Shinbu Special Attack Squadron and piloted an Army Type 97 Fighter (Allied code name of Nate). After his death in a special attack, he received a promotion to Captain. He was from Nagano Prefecture, attended Tōkyō College of Science, and was a member of the 1st Class of the Army Special Cadet Officer Pilot Training (Tokubetsu Sōjū Minarai Shikan) Program. At the time when the arrogant enemy now approaches the mainland, in the morning I will depart to destroy them completely. I write a note to you my parents first and to everyone in my old home. I deeply appreciate that I was able to have a happy life through your kindness deeper than the sea and higher than the mountains. Now in this way my departure to go is repayment for your kindness. As a Japanese person I believe that this is greatest repayment of your kindness. I deeply feel that my life was truly happy. It is an especially unforgettable inspiration that I was granted as a student with a personal inspection by the Emperor in front of the Imperial Palace on May 22, 1939, and was privileged with the honor as a representative. Even now the deep emotion of that time is engraved in my mind. It is unnecessary to enumerate one by one the rest of them. I just have only appreciation for the time that I was happier than anyone. Now there are no regrets. I was not able to send greetings one by one to the persons who treated me kindly. I intend to go to die in a splendid way. Please do not cry in front of other people. The letter comes from Chiran Tokkō Irei Kenshō Kai (2005, 106). The biographical information in the first paragraph comes from Chiran Tokkō Irei Kenshō Kai (2005, 106, 181) and Osuo (2005, 196).